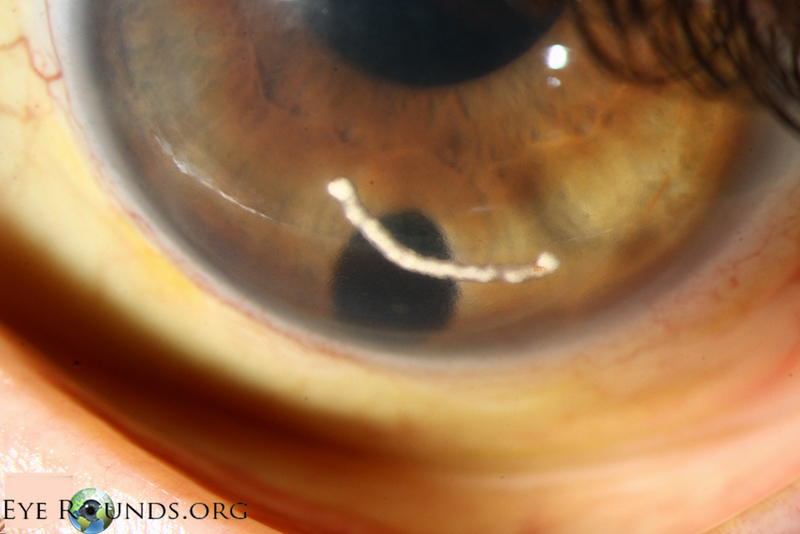 This patient presented with marked corneal edema one month after the intra-vitreal injection of a dexamethasone implant (Ozurdex®) for macular edema. He was aphakic due to a prior open globe injury and repair. He had also undergone vitrectomy for a prior retinal detachment. On our initial exam, the implant was not visible in the anterior chamber. However, the patient said he slept face down and every morning when he awoke, he could see something white on his eye in the mirror. During our exam, we had the patient look down to the floor for a few minutes. At that time, the implant was readily seen in his anterior chamber. The implant was urgently removed in order to decrease the risk of continued endothelial decompensation. According to the package insert, the Ozurdex is contraindicated in aphakic patients and patients with an anterior chamber intraocular lens who do not have an intact posterior capsule. 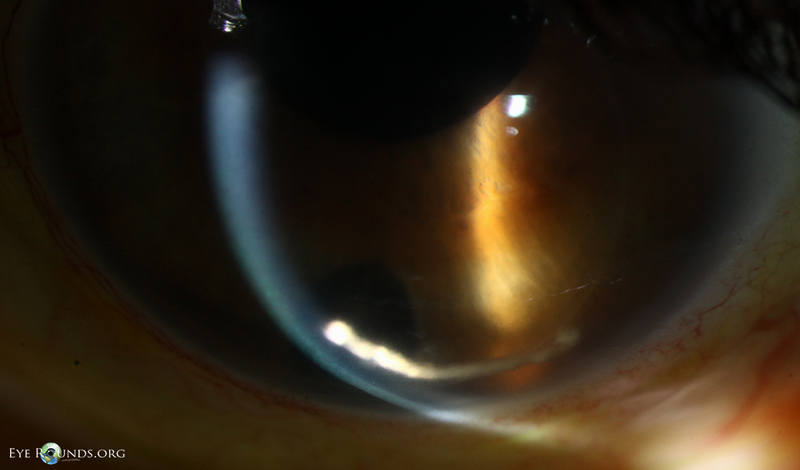 Some reports suggest that all patients with a compromised capsule and a history of vitrectomy, even those with a posterior chamber intraocular lens, are at risk for corneal edema secondary to migration of the Ozurdex into the anterior chamber. Khurana RN, Appa SN, McCannel CA, Elman MJ, Wittenberg SE, Parks DJ, Ahmad S, Yeh S. Dexamethasone implant anterior chamber migration: risk factors, complications, and management strategies. Ophthalmology. 2014 Jan;121(1):67-71. PubMed PMID: 23890421.